October 6, 2018 Robert W.
Fast same day signs and banners are sometimes needed in a hurry in a 24 hour town like Las Vegas. In Las Vegas, there is always something going on in town at all hours of the day and night. While conventions and trade shows have normal business hours of 8am to 5pm, the crews setting up the shows are working feverishly the night before to make sure everything is a go for the next day. However, often things do not go as planned and signs get damaged and need to be replaced in the last minute. Fortunately, there are sign stores in Las Vegas that can make and replace lost or damaged signs in a hurry. Also, shipping companies will often ship your sign package to the wrong destination or it will arrive damaged. In cases like this, your signage needs to be replaced in a hurry because the convention or trade show will not wait for you. Often vendors coming into Las Vegas for an event will have their signs, banner stands and banners made locally to avoid issues. 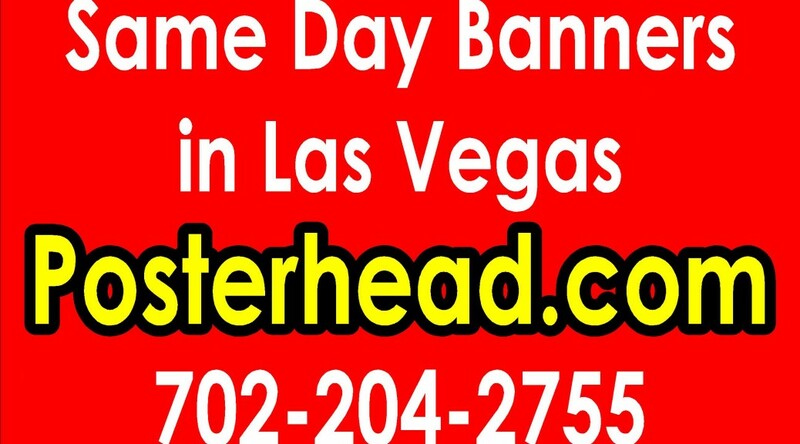 Fast same day signs and banners are available by sign shops that services the many events and exhibitions in Las Vegas and there are many. Las Vegas is known as the “Convention and Trade Show” capital of the United States and hundreds of events and shows take place yearly . In fact, Las Vegas is host to some of the biggest conventions in the world where hundreds of thousands of people attend. Sign shops may charge a slight premium for same day signage because other production has to be rescheduled and overtime has to be paid to make up for that lost time. Don’t panic if you find yourself in need or rush order graphics because Las Vegas sign shops are there to help you.